Is Cypress Semiconductor's Dividend Safe? 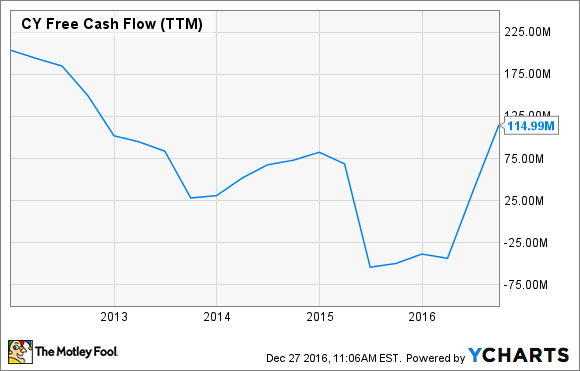 The tech company pays an attractive dividend yield, but is that a good reason to buy in? Cypress Semiconductor (NASDAQ:CY) has undergone a number of changes in the last two years, which has put the business under pressure lately. The company pays an attractive dividend, a rarity in the semiconductor space. The short-term concerns have led to some worry over the safety of that dividend. Here is what investors need to consider. Cypress Bluetooth Low Energy Pioneer development kit. Image source: Cypress Semiconductor. The changes at the company got under way a couple years ago with its first of two buyouts. In early 2015, Cypress announced it would be purchasing rival microcontroller (MCU) maker Spansion in a stock deal worth $5 billion and consolidating operations to exploit synergies and cost savings. That deal was followed up with another this past summer. Broadcom's Internet of Things (IoT) division was purchased for $550 million in cash, reinventing the Cypress model and making the company a leading IoT chip supplier. The moves were exciting news for shareholders, but they also squeezed the company's bottom line. Cypress returned to profitability last quarter, but is sitting on a $487 million loss so far for 2016. And in the midst of these issues, management underwent a shakeup. The company founder and longtime CEO T.J. Rogers decided to retire and former executive Hassane El-Khoury stepped in to fill the void. Since taking the reins, he has reiterated Cypress' dedication to growing its IoT business, but getting the bottom line back on track has also become a primary goal. With that being the case, is it reasonable to expect the company will continue paying its dividend? It is worth noting, though, that Cypress has not raised this amount since 2012. Also important to consider is the big dip in the bottom line and the share price coming under pressure over the last few years, which changes the dividend yield picture a bit. The current yield is high, but a few years ago it was a more modest figure when the dividend was first put in place and share prices were a solid 25% higher than they are now. The short-term unprofitability picture has also led management to consider marking the dividend as "return of capital" rather than a dividend. The difference? Return of capital is usually paid out of investor's equity in the business rather than out of free cash flow and is a sign the company is struggling to generate profitability. However, Cypress has said to plan on counting the payment as a cash dividend rather than return of capital, but a final decision will be made early in 2017. This seems like a safe assumption as Cypress continues to generate positive free cash flow, or money left over after expenses are paid. With that metric on the mend, the dividend appears to be stable at the moment. Should investors buy because of the dividend? The company has made no indication that its cash payout to investors is at risk of getting sliced and diced in spite of the short-term squeeze, and the semiconductor company continues to execute its rebound strategy. That being said, I wouldn't hold my breath for any raises anytime soon. The main story here is Cypress' transformation as it builds out its new IoT business and looks for ways to cut costs to boost the bottom line. Even though that yield is a nice bonus, the real reason to buy Cypress is for the potential stock price appreciation if the current rebound efforts pay off.